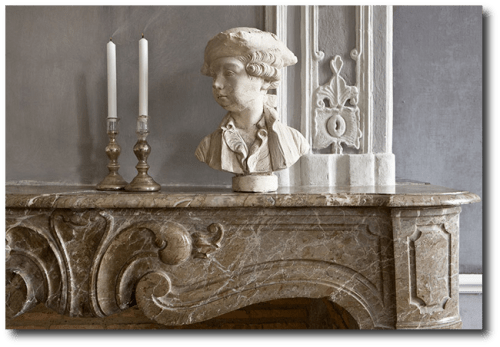 Aurélien Deleuze and his wife, Pascale, have ren0vated this sensational old world 1700′s chateau that was originally built by an minister who was knighted by Louis XIV. 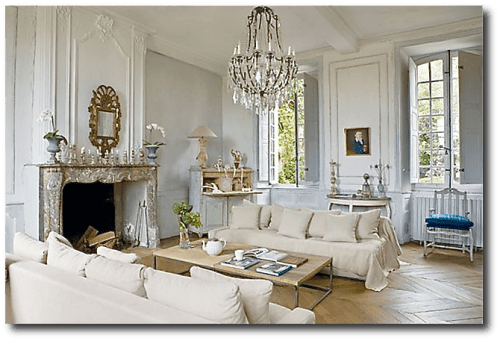 The home sits in the town of Pau, in south of France and has a distinct French country flavor which can be seen in the furniture and the architectural choices. Whether you are re-decorating with French tastes in mind, or a life-long admirer of the Provence style, this house is certainly one to study. The couple were not afraid of tackling such a magnificent structure, as they were lovers of architecture and interior design. 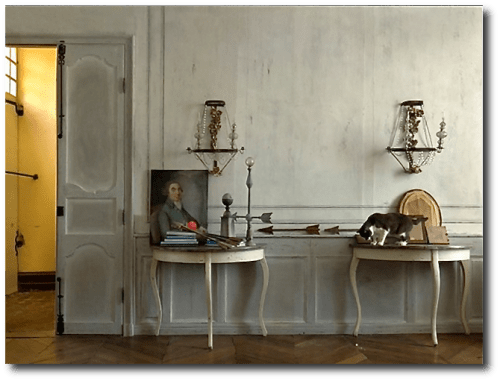 Their restoration preserved all the beautiful details, and gorgeous antiques and decor were found at the local Parisian flea markets which added to the period touches of the home. Inside, you will see captivating stucco ceilings, and painted plaster walls that are magnificently detailed. Consider getting the look of their living room by painting your walls a light blue and working with blue and beige furnishings. Demilune tables line the wall in a light painted ivory finish. Linen is casually draped over the sofas with matching throw pillows. The furniture makes this room comfortable, yet functional, and still holds to the aesthetic period style of the home. 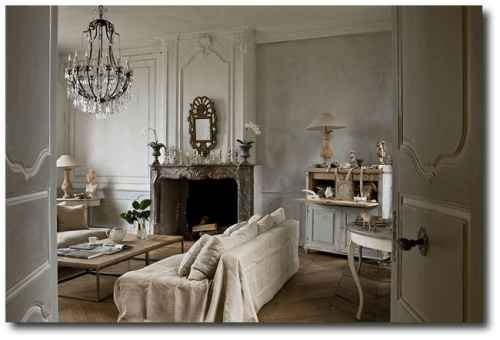 In this post below we have collected the very best Linen furniture on Amazon with a French flare. Consider working with all-natural fabrics in your home to achieve that rustic old world charm. A Swedish secretary in a light blue sits in the corner of the room, and a reclaimed wood coffee table float in between the sofas. Furntiure is distressed and worn showing years of love and use. In this picture we zoom in on the country French chair with the velvet upholstery sitting along the wall in the Deleuze's home. In the post we list a chair made from Currey & Company whom sells a terrific reproduction chair almost identical to Deleuze's chair, listed at 2,138.00. If that is a bit pricey, consider shopping on ebay under "Country French Chair" and comparable chairs will surface for lower price points. In the picture the chair seems to have a rich velvet cushion which highlights the blue tones in the antique painting on the wall. The bright blue also works nicely picking up the hue of the wall color and the painted secretary in the corner. This painted Louis XV chair has the same rich velvet blue tone seen in the cushions making this fabric a supreme choice for your furnishings. Velvet is usually rich in color and adds vibrant touch to a muted color palette. The living room is based around blues, and the faux finishes found in their bedroom and bathroom give this home a historical presence. The home retains the original floors, and the over sized kitchen has an impressive fireplace from the 1600s that brings warmth to those cold windy nights. 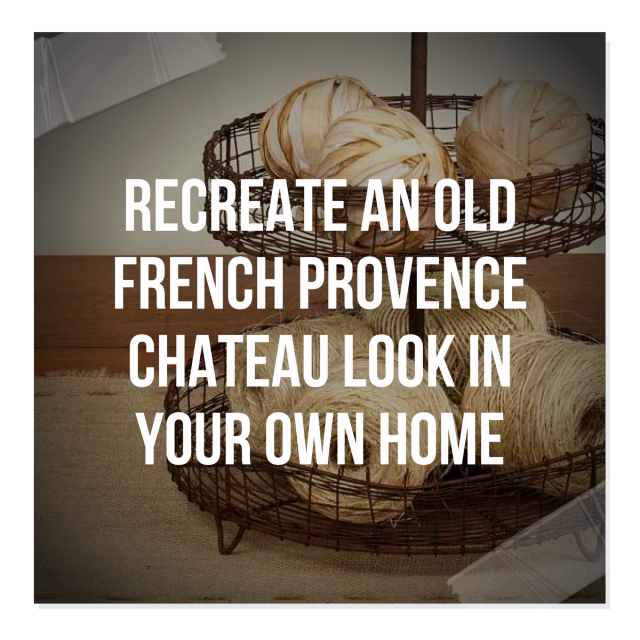 In the dining room, a rustic plank table serves as a long traditional table for friends and family to gather around for traditional French dining. See additional photos at Gilles Trillard's Website , Property’s website: Magie des Lieux. If you like this article, please leave a comment, and pin it on facebook and pinterest, and come again!